Welcome to the Missouri Valley Regional Meeting! Emporia State University has planned a great meeting in Wichita, KS. 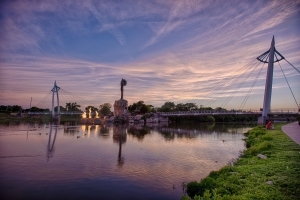 Wichita is the largest city in Kansas and offers many attractions that can be enjoyed by everyone. Chapters attending will be able to make professional connections, present their chapter, and grow as a chapter. Chapters will be able to participate in Best Practices and showcase their chapters in Chapter Operations, as well as learn skills from the Keynote Speaker and the Professional Sessions. Hope to see you there! For chapters who wish to present in Chapter Operations: Chapter Operations Abstract Form. The due date is February 28, 2019. Cancellation Policy: Cancellations made prior to Friday, March 15, 2019, will be refunded. Cancellations received after this date and no-shows will not be refunded. If you encounter an emergency, please contact the conference planner at mackenzie.keel@aicpa-cima.com and the request will be forwarded to the Executive Director for refund approval. *To receive the group rate, please indicate that you are part of the 2019 Beta Alpha Psi Missouri Valley Regional Conference. Complimentary self-parking in the parking garage for overnight guests. Outdoor parking and city lots located within two blocks of the hotel range $1.25-$4.00 daily. There are many great attractions in Wichita, KS. Old Town is full historic museums, restaurants, and brewery. Other attractions include the Sedgwick County Zoo, the Botanica Gardens, and movie theaters. Jan Steinert works at Spirit AeroSystems as the IT Senior Manager, IT Business Management and IT Communications. Mrs. Steinert has worked at Spirit AeroSystems almost 13 ½ years. She has held positions as an IT Senior Manager, an IT Senior Manager and Global Infrastructure and Operations, an IT Senior Manager and Customer Relationship Management, and now resides in her current position. Before Spirit AeroSystems, Mrs. Steinert worked at Boeing as a IT Senior Manager. Mrs. Steinert is an alumni of Emporia State University, University of Washington, and Columbia Business School. Mrs. Steinert is bringing two associates with her: Kelsey Baughman who is the Information Technology Manager at Spirit AeroSystems, and Loretta Coccetella who is a Vendor and Business Management Analyst at Spirit AeroSystems.